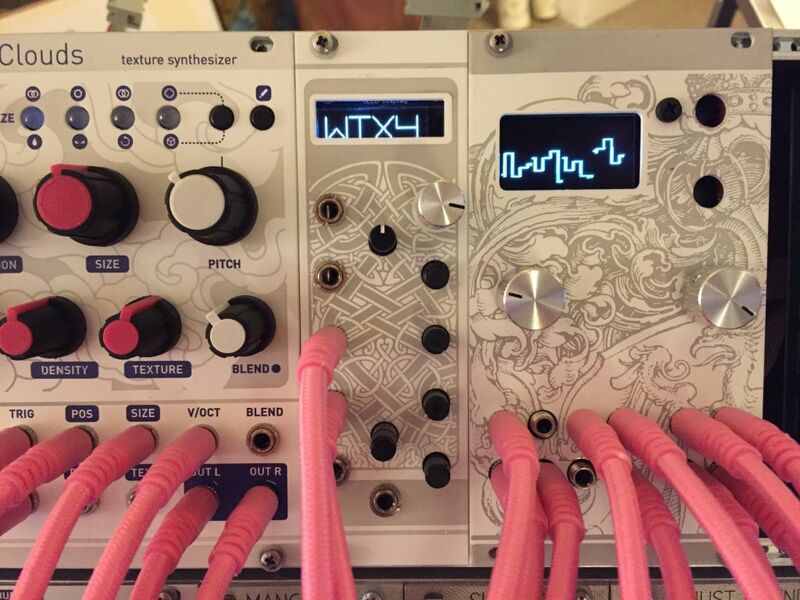 MUFF WIGGLER :: View topic - Announce Thread: Magpie Modular - uBraids - Braids in 8 HP. Announce Thread: Magpie Modular - uBraids - Braids in 8 HP. I'm happy to announce that I've managed to get this project in a decent enough shape to share it publicly. It's a derivative of the Mutable Instruments Braids module where we shrunk down the footprint to half of the original (a miniature 8HP) and added a OLED and atmega chip to drive it. It functions, flashes, operates the same as a regular Braids so you can put whatever firmware you like on it including Tim Churches Bees in the Trees. I will be uploading a complete BOM, a more fleshed out build guide, schematics and diptrace file in the near future. Im using the project page & Github as the main repository for information but I will try to answer questions here. Whoa! That's amazing. Awesome idea, and for sure something I'll look into building. This is neat, should power consumption be the same / about the same? "Display current draw is completely dependent on your usage: each OLED LED draws current when on so the more pixels you have lit, the more current is used. They tend to draw ~15mA or so in practice but for precise numbers you must measure the current in your usage circuit." this is bad yelp review or write your senator worthy! Like the display and panel. I did have a look at your display INO... is your plan to use the Braids code without modification and get the AVR to pretend to be LED displays? this looks great. saw it today. super excited. oleds are great. yeah, it's a creative/primitive duct tape and efficient cutting of corners to achieve the end goal. I ordered two as soon as I saw you put these up, really looking forward to building these. I'm considering to swap my 2 braids for these! The first in a series of shrunken MI, I hope? I'm definitely going to have to build this! Any videos of how the menu diving looks? Exactly the same as Braids - the OLED display is just emulating the 4 character LED display on Braids, at least as it stands. Firmware changes to make better use of the OLED would be possible if someone wants to take on the project. Exactly the same as Braids - the OLED display is just emulating the 4 character LED display on Braids. Gotcha. That is just for now... I'll work on making it so the OLED shows more once I build up the modules. Next can you make micro Elements? Love the creative use of the OLED replacement; it is perfect that you kept the core MI firmware AS-IS. Kudos for clever hackery! As far as I understand, the whole point of this is to not fork the firmware, but to have uBraids 100% compatible softwarwise to MI braids. No problem, the OLED runs off its own MCU. Ok, but wouldn't " make better use of the oled" imply changing things in the braids firmware, hence breaking compatibility?